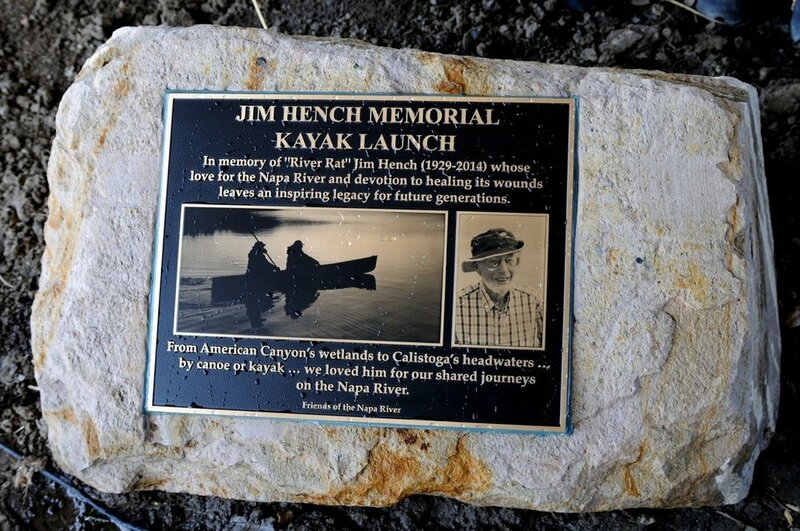 Supervisor Brad Wagenknecht, FONR President Bernhard Krevet, Mayor Jill Techel and FONR founding President Moira Johnston Block unveil the plaque commemorating the new Jim Hench Memorial Kayak Launch. Photos by Lowell Downey. Shari Gardner, executive director of Friends of the Napa River, joins more than 20 other people who kayaked or paddleboarded their way upriver to the new Jim Hench Memorial Kayak Launch, near the First Street bridge in downtown Napa. More than 80 spectators attended a dedication ceremony Sunday morning to honor Hench, the advocate for the Napa River’s beautification and flood protection who died in 2014 at age 85. Speakers including Mayor Jill Techel, Napa County Supervisor Brad Wagenknecht, and Hench’s allies Bernhard Krevet and Moira Johnston Block shared their memories of the Friends of the Napa River co-founder, who campaigned for the Napa River flood control project and wider access to water recreation. Newer PostThe Napa River needs Friends!